CareFusion's PHANTOM Gel Nasal Cushion Mask with standard 2 point Headgear. 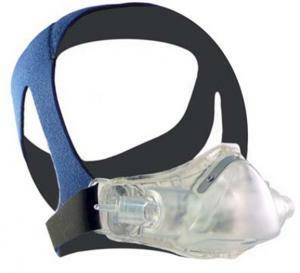 This is a revision of the original SleepNet manufactured mask with a clear gel. This mask is latex free and also works well with those with silicone sensitivity since the cover is made with polyurethane. This gel mask features a minimal-material design with gel and flexible frame you can bend and mold to adapt to your facial features. The headgear has a two point attachment. If you are looking for a mask and headgear that is just barely in contact with your head and face, this is it!